Universities Crack Down on Tailgate Tradition Universities across the country are placing restrictions on tailgating to curb underage and binge drinking. Tailgaters say they're cracking down on the wrong people. School officials say the restrictions will please the majority of fans. 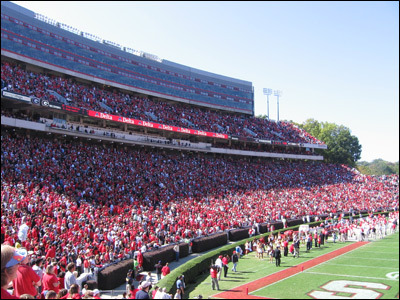 More than 90,000 people -- the equivalent of a small town -- come to Sanford Stadium to see the Bulldogs play. Georgia will play Auburn on Saturday in a high-stakes game. While Georgia’s season has been faltering. Auburn is ranked in the top ten in all the college football polls. Every weekend, thousands of college football fans look forward to the big game and the celebration associated with it: the tailgating party. To some, tailgating is a tradition that's as important as the sport. But universities have been trying to clean up campuses and cut down on tailgating. This year, the University of Georgia is among them. "Every home game, we cook six pounds of chicken wings, 100 pork skewers, five or six pounds of sausage," says Russ Goodman from Homerville, Ga. 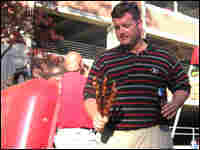 He drives four hours to get to Athens for the game, and mans two grills on a grassy corner spot outside the stadium. 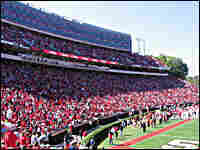 Tailgating this year at the University of Georgia includes parking restrictions, family-friendly zones which are alcohol free, and a ban on setting up tailgate tents and parties until 7 a.m. on the day of the game. The new regulations came about because of last season's game against Auburn. Matt Brachowski, assistant athletic director at the University of Georgia, says the game between the rival teams took place at night, so more people were on campus longer and more trash was created. "Georgia lost the game, which contributed to some seeing fit to destroy campus grounds...," Brachowski says. Over the past several years, a number of universities across the country have adopted tailgating restrictions, including Florida and Tennessee. Both Notre Dame and Penn State have instituted a no-alcohol policy at tailgate parties during games. Regulations at North Carolina State came after an incident last year when two people were killed during a tailgate party. Billy Molasso at Northern Illinois University has worked on college health issues at several schools. He says campuses have had to deal with more garbage, alcohol incidents and hospital visits because students are drinking way too much. "Anything that colleges and universities can do to improve the environment and the culture on campus and to prevent the secondary consequences of alcohol abuse, is a good thing," Molasso says. Schools that have had tougher tailgating rules for several years say they now have fewer alcohol-related problems after games. The University of Georgia says its campus is cleaner and safer. Campus police are enforcing the underage drinking law, and the local police say they've had about the same number of incidents as they did last year. Tailgaters like Jeff Brown from Clinch County say the administration is cracking down on the wrong people. School officials, on the other hand, say they've made the changes for the majority of fans who come to enjoy the game, not for those who come to the campus to drink and party excessively. Rival teams, Georgia and Auburn will play each other on Saturday in a high-stakes game. While Georgia's season has been faltering, Auburn is ranked in the top ten in college football polls.